The Maitri Project is a project by seniors from Mount Madonna School as part of the Values in World Thought Program. The students will begin the learning journey to India on March 23 to April 7, 2019. Maitri means 'friendship' and embodies what we strive to bring with us on our adventure. Dinner and dance farewell party! Today was our first full day in India. It was also my first time out of the United States; it was a culture shock, to say the least. We started our day on a bus headed to Jama Masjid, the largest mosque in India. The bus ride itself was our first glance into the whole new world we had entered. Once at the mosque, we were given a tour and the rare opportunity to see ancient artifacts that once belonged to Mohammed, the prophet and the founder of Islam. They had been brought to India from Turkey and cared for by the same family for 17 generations. After learning the history of the rare artifacts, we climbed to the top of a tower connected to the mosque. Our assent up into the tower was dark, the walkway became increasingly narrower, it was humid, and it felt like it was never going to end. However, once we reached the top, we were rewarded with an unforgettable view of Old Delhi, that stretched on and on and seemed endless. Next, we got to explore the hectic, intense, and fast paced market streets. The smells changed on every block. Fasts cars, rickshaws, and motorcycles weaved in between people, beautiful colors flooded the streets, as well as stray dogs and trash. India is an invasion of the senses. I woke up earlier than I should have today, considering how little sleep we got after arriving late last night. I woke up anxious and curious as to what it was that I was going to be seeing today. After getting ready and eating breakfast with the group, we headed out at a quick pace. The first thing we did was visit Jama Masjid. We took our shoes off, and when we stepped inside, I realized that I recognized it from photos from previous trips. In other words, it didn’t feel real until it was. Even though I’m slightly afraid of heights, I chose, with the rest of my class, to climb up an incredibly long and narrow pathway to reach the top of a tower. When we reached the top, I felt incredibly accomplished. With all of us heavily breathing and staring out into the incredible view, I could tell without looking that we were all smiling and bonding over the view and the fact that our thighs burned. 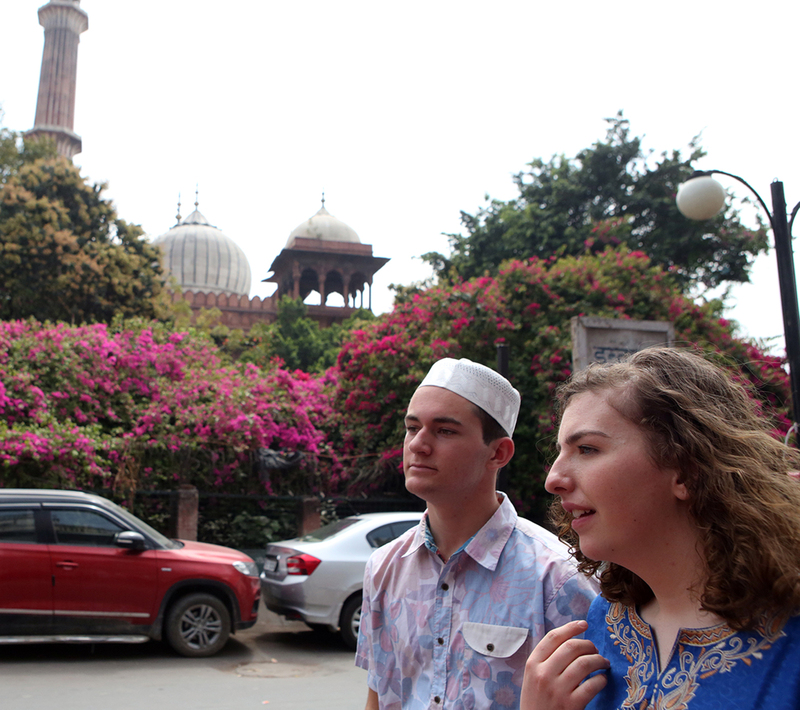 After our time at the mosque, we traveled into the market streets of Old Delhi, and honestly, I’ve never been more grateful for my class in my life. We stuck as closely together as we could, as we avoided motorcycles and other vehicles left, right, up and down. I was struck to see how different life is here; so many sights and smells, it was quite overwhelming. Now, I feel like I can take on any major city in the United States. We stopped to eat lunch in New Delhi and had time to shop as well. The attention we got was very different in New Delhi than it had been in Old Delhi. We weren’t bombarded with people asking, or not asking, to take our photos, and we weren’t stared at like we were in Old Delhi. These two places are not that far from each other, yet, they were totally different worlds. Today has really been quite the rollercoaster. I’ve only been in the daylight of India for 12 hours, and it’s already offered me an intense and exhilarating experience. We spent the day venturing throughout Delhi; visiting the Jama Masjid mosque and exploring the crazed marketplaces. The energy of the city filled me up and wiped away the jet lag; everywhere you look there’s something new and surprising. This goes to show just how unique this country’s culture is compared to other countries I have visited. With such a shocking and eventful day, it really takes time to take it all in and reflect on the experience. Something I noticed was the income inequality that exists in India. 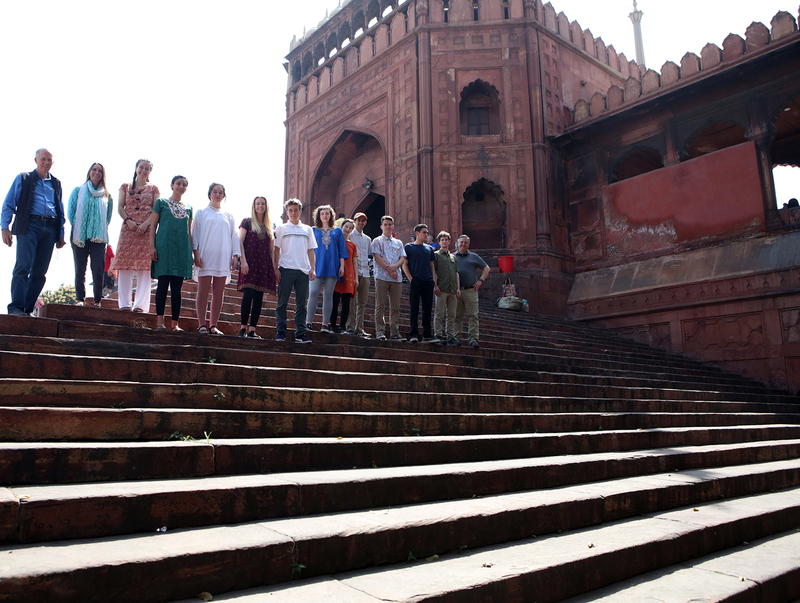 Our day included activities in Old Delhi and New Delhi, which are places that reflect these differences. 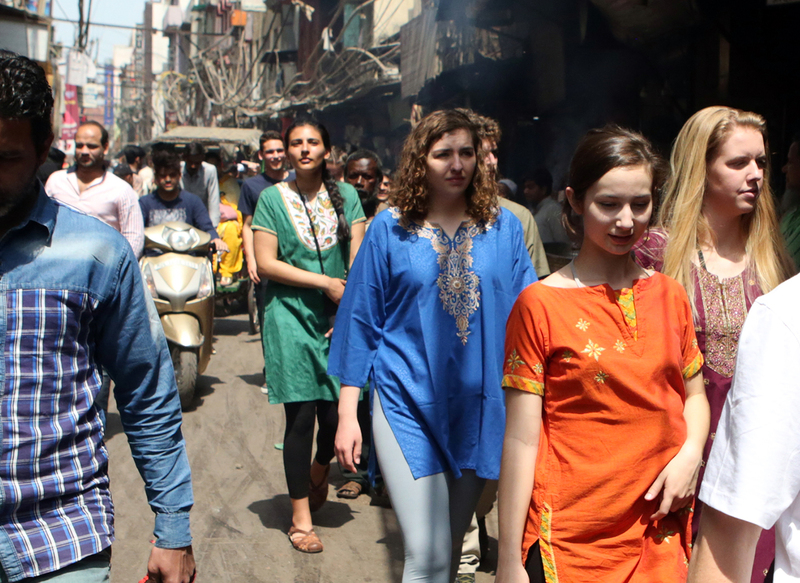 We decided to take a walk through the marketplaces in Old Delhi. They consist of slim and tight alleys, covered with hundreds of wires overhead, and overflowing with people. Motorcycles and Rickshaws were flying by our side and all our senses were under attack. The thick concentration of people and buildings was something I had never seen before, and the poverty was bewildering. New Delhi on the other hand, only a short bus ride away, was very different. The city was far more developed and modernized, the people wore less traditional clothes, and the buildings and people were spread out from each other. Overall, this impacted me because I had preconceived notions of the income inequality in India, but it was completely surreal to witness and experience it in person.